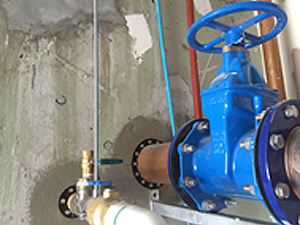 LINK-SEALS can be installed wherever a pipe passes through a solid structure. 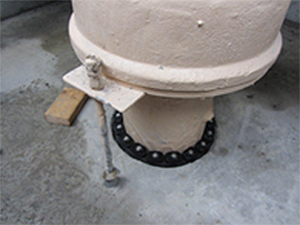 The most common use is through concrete walls and or floors. 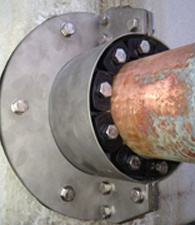 Link-Seals has even been used to seal pipes coming through steel bulkheads in ships. 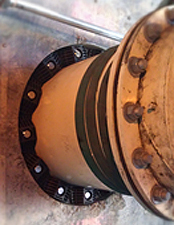 For the client that has a “movable” or “for hire” water or wastewater treatment plant, the Link-Seal is the best possible solution because it can be removed and refitted in a timely manner. 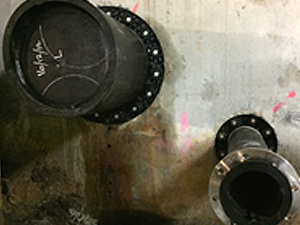 Ductile iron, concrete, metal as well as plastic pipes may be hydrostatically sealed within walls to hold up to 20 psig (40 feet of static head). 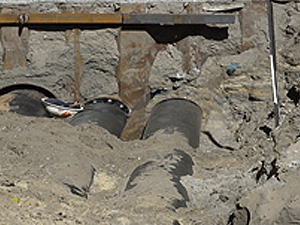 The annular space between carrier pipes passing through casings may be sealed against the entry of water, soil or backfill material. 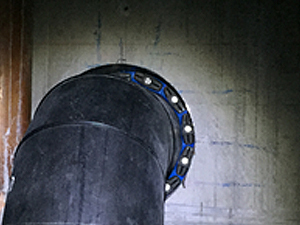 Step 1: Center the pipe, cable or conduit in wall opening or casing. Make sure the pipe will be adequately supported on both ends. 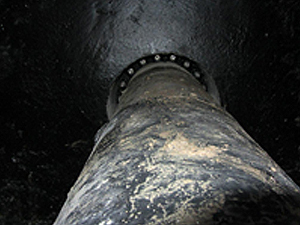 Link-Seal® Mechanical Seals are not intended to support the weight of the pipe. 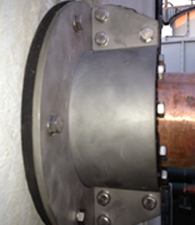 Step 2: Adjust the pressure plates just enough so that links move relatively freely. 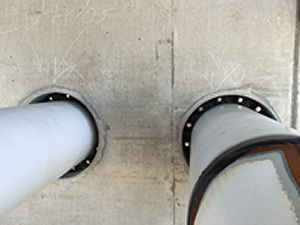 Connect both ends of belt around the pipe. Step 3: Check to be sure all bolt heads are facing the installer. Extra slack or sag is normal. Do not remove links if extra slack exists. 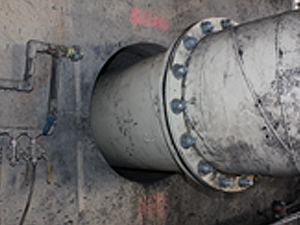 Note: On smaller diameter pipe, links may need to be stretched. Step 4: Slide belt assembly into annular space. Ensure that both front and back plates are inside the penetration. For larger size belts, start inserting Link-Seal assembly at the 6 O’clock position and work both sides up toward the 12 O’clock position in the annular space. Step 5: LS-200 thru. LS-315: Using a hand socket allen head or off-set wrench ONLY, start at 12 O’clock. Working in a clock- wise manner, tighten each bolt. Do not tighten any bolt more than 4 turns at a time until links have been uniformly compressed. 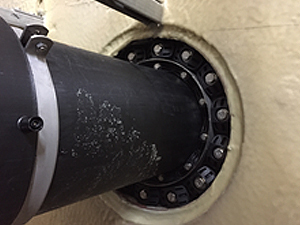 Step 6: Make 2 or 3 more passes at 4 turns per bolt MAXIMUM, tightening all bolts clockwise until all sealing elements “bulge” around all pressure plates. On type 316 stainless steel bolts, hand tighten ONLY – do not use power tools.